Ionic liquids are, in contrast to most classical solvents and molten salts, highly structured due to their structural complexity. Aside from Coulombic interactions, there is a set of specific and non-specific interactions of different strengths, such as cation-p-bonding, p-p-bonding, hydrogen bonding, van-der-Waals and dipole-dipole interactions. Many ionic liquids are known to form mesophases, such as ionic liquid or plastic crystals. This shows how critical interionic forces are in determining the liquid structure, the solvation properties and many other physico-chemical properties (such as the liquid range, viscosity, conductivity as well as the interaction with interfaces and solutes). Because of order, the liquid might become inhomogeneous and its properties might even be anisotropic, which is unexpected for a classical liquid. Important questions that guide our research activities are: How are the ions organized in an ionic liquid? What are the interactions responsible for the liquid structure? What is the relationship between solvent structure, properties and performance? How can the structure and the properties of an ionic liquid be controllably tuned (for a certain application)? To answer these questions, the Mudring laboratory investigates the structure of ionic liquids with a focus on diffraction techniques. The knowledge on the structure of ionic liquids and interactions between ions in ionic liquids is used for a systematic development of ionic liquids with improved properties for specific applications. The crystal structure can give valuable information about specific interactions in ionic liquids. Their knowledge allows, for example, identifying interactions that increase the stability of the solid (vs. the liquid) and facilitate crystallization. Avoiding these through an anti-crystal engineering approach helps to improve the liquid properties of a salt. To this avail, the crystal growth of ionic liquids is studied at sub-ambient temperatures. A specific technique is the in-situ crystal growth of ionic liquids on the diffractometer for single X-ray diffraction structure analysis. Temperature-dependent SAXS (small angle X-ray scattering) is a powerful tool to elucidate the evolution of IL structures and identify mesophases. 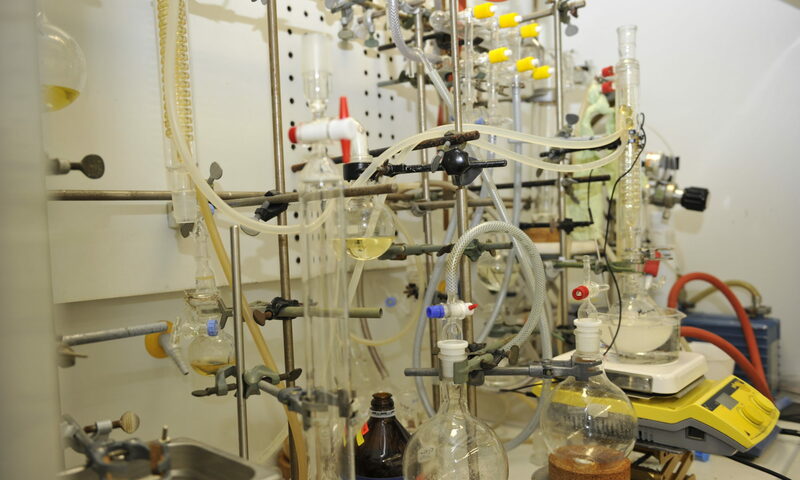 SAXS setup at DESY, Hamburg, used for the structure and mesophase formation in 1,3-bisalkyl-1,2,3-triazolium halide ionic liquids. Structure model for the smectic C phase of [C12C10Tr]Br and corresponding diffraction patterns. DSC thermogram and temperature dependent conductivity of [C10C10Tr]I.
D. Prodius, M. Wilk-Kozubek, A.-V. Mudring, Synthesis, structural characterization and luminescent properties of 1-carboxymethyl-3-ethylimidazolium chloride, Acta Cryst. C, 2018, 74, 653-658. DOI: https://doi.org/10.1107/S2053229618005272. A.S.R. Chesman, M. Yang, B. Mallick, T.M. Ross, I.A. Gass, G.B. Deacon, S.R. Batten, A.-V. Mudring: Melting point suppression in new lanthanoid(III) ionic liquids by trapping of kinetic polymorphs: an in situ synchrotron powder diffraction study, Chem. Commun., 2012, 48, 124-126. DOI: 10.1039/C1CC14744G. 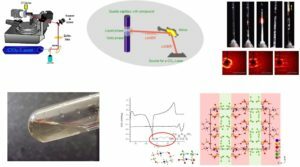 T. Bäcker, O. Breunig, M. Valldor, K. Merz, V. Vasylyeva, A.-V. Mudring: In-situ crystal growth and properties of the magnetic ionic liquid [C2mim][FeCl4], Cryst. Growth Des., 2011, 11, 2564-2571. DOI: 10.1021/cg200326n. P. Nockemann, K. Binnemans, B. Thijs, T.-N. Parac-Vogt, K. Merz, -V. Mudring, P.-C. Menon, R.-N. Rajesh, G. Cordoyiannis, J. Thoen, J. Leys, C. Glorieux: Temperature-driven Mixing-Demixing Behavior of Binary Mixtures of the Ionic Liquid Choline Bis(trifluoromethylsulfonyl)imide and Water, J. Phys. Chem. B, 2009, 113, 1429-1437. DOI: 10.1021/jp808993t. T. Timofte, -V. Mudring: A Systematic Study on the Crystal Structures of TlMX4 (M = Al, Ga; X = Cl, Br, I), Z. Anorg. Allg. Chem., 2009, 635, 840-847. DOI: 10.1002/zaac.200801375. T. Timofte, S. Bremm, -V. Mudring, G. Meyer: (NH4)[GaCl4] and (NH4)[InCl4] Revisited, Z. Anorg. Allg. Chem., 2009, 635, 1890-1893. DOI: 10.1002/zaac.200900008. T. Timofte, -V. Mudring: Indium(I) Tetraiodoaluminate, InAlI4, Z. Anorg. Allg. Chem., 2008, 634, 622-623. DOI: 10.1002/zaac.200700525. T. Timofte, -V. Mudring: Indium(I) Heptachlorogallate(III), InGa2Cl7, Z. Anorg. Allg. Chem., 2008, 634, 624-625. DOI: 10.1002/zaac.200700526. T. Timofte, S. Pitula, -V. Mudring: Ionic liquids with Perfluorinated Alkoxyaluminates, Inorg. Chem., 2007, 46, 10938-10940. A. Babai, -V. Mudring: N-Methyl-N-propylpyrrolidinium iodide, Acta Cryst., 2005, E61, o2913-o2915. A. Babai, -V. Mudring: 1-Ethyl-2,3-dimethylimidazolium bromide monohydrate, Acta Cryst., 2005, E61, o1534-o1535. T. Timofte, -V. Mudring: Indium(I) tetrachloroaluminate, Acta Cryst., 2005, E61, i199-i200. Chand, M. Wilk-Kozubek, V. Smetana, A.-V. Mudring, 1, 2, 4-Triazolium ionic liquids and liquid crystals, J. Mat. Chem. C, 2018, submitted. Stappert, E.T. Spielberg, A.–V. Mudring, Photoisomeriable ionic liquids and ionic liquid crystals, Cryst. Growth Design, 2018, submitted. Stappert, K. Gruebel, R. Kentsch, A.–V. Mudring, Triazolium Ionic Liquids as Electrolytes in Dye Sensitized Solar Cells, ChemSusChem, 2018, submitted. Yang, M. Hölter, B. Mallick, A.–V. Mudring, 1-Alkyl-2-methyl-3-dodecylimidazolium Bromides: How Does C2-Methylation at the Imidazolium Ring Affect Mesophase Formation?, Cryst. Growth Design, 2018, submitted. K. Stappert, G. Lipinski, G. Kopiec, E.T. Spielberg, A.-V. Mudring, Mesophase stabilization in ionic liquid crystals through pairing equally shaped mesogenic cations and anions, Crystal Growth Des. 2015, 15, 5388-5396. DOI:10.1021/acs.cgd.5b01023. K. Stappert, J. Muthmann, E.T. Spielberg, A.-V. Mudring, Azobenzene-Based Organic Salts with Ionic Liquid and Liquid Crystalline Properties, Crystal Growth Des. 2015, 15, 4701-4712. DOI:10.1021/acs.cgd.5b01024. K. Stappert, D. Ünal, B. Mallick, A.-V. Mudring, The influence of the counter anion on the ability of 1-​dodecyl-​3-​methyltriazolium ionic liquids to form mesophases, Cryst. Growth Des. 2015, 15, 752-758. DOI:10.1021/cg501564j. K. Stappert, A.-V. Mudring, Triazolium Based Ionic Liquid Crystals: Effect of Asymmetric Substitution, RSC Advances 2015, 5, 16886-16896. DOI:10.1039/C4RA14961K. M. Yang, B. Mallick, A.-V. Mudring, A systematic study on the mesomorphic behavior of asymmetrical 1,3-dialkylimidazolium bromides, Cryst. Growth Des. 2014, 14, 1561-1571. DOI:10.1021/cg401396n. K. Stappert, D. Ünal, B. Mallick, A.-V. Mudring, New Triazolium Based Ionic Liquid Crystals, J. Mat. Chem. C 2014, 2, 7976-7986. DOI: 10.1039/C3TC31366B. M. Yang, K. Stappert, A.-V. Mudring, Bis-cationic ionic liquids, J. Mat. Chem. C, 2014, 2, 458-473. DOI: 10.1039/C3TC31368A. M. Yang, B. Mallick, A.-V. Mudring, On the mesophase formation of 1,3-dialkylimidazolium ionic liquids, Cryst. Growth Des. 2013, 13, 3068-3077. DOI: 10.1021/cg4004593. J. Bäcker, S. Mihm, B. Mallick, M. Yang, G. Meyer, A.-V. Mudring: Crystalline and Liquid Crystalline Organic-Inorganic Hybrid Salts with Cation-Sensitized Hexanuclear Molybdenum Cluster Complex Anion Luminescence, Eur. J. Inorg. Chem., 2011, 4089-4095. DOI: 10.1002/ejic.201100365. A. Getsis, A.-V. Mudring: Switchable Green and White Luminescence in Terbium-based Ionic Liquid Crystals, Eur. J. Inorg. Chem., 2011, 3207–3213. DOI: 10.1002/ejic.201100168. A. Getsis, -V. Mudring: A Luminescent Ionic Liquid Crystal: [C12mim]4[EuBr6]Br, Eur. J. Inorg. Chem., 2010, 2172-2177. DOI: 10.1002/ejic.200901220. X. Wang, F.-W. Heinemann, M. Yang, B. Melcher, M. Fekete, A.-V. Mudring, P. Wasserscheid, K. Meyer: A new class of double alkyl-substituted, liquid crystalline imidazolium ionic liquids—a unique combination of structural features, viscosity effects, and thermal properties, Chem. Commun., 2009, 7405-7407. DOI: 10.1039/B914939B. A. Getsis, B. Balke, C. Felser, A.-V. Mudring: Dysprosium-Based Ionic Liquid Crystals: Thermal, Structural, Photo- and Magnetophysical Properties, Cryst. Growth Des., 2009, 9, 4429-4437. DOI: 10.1021/cg900463b. A. Getsis, A.-V. Mudring, Structural and Thermal Behaviour of the Pyrrolidinium Based Ionic Liquid Crystals [C10mpyr]Br and [C12mpyr]Br, Z. Anorg. Allg. Chem. 2009, 635, 2214-2221. DOI: 10.1002/zaac.200900216. A. Getsis, A.-V. Mudring: Imidazolium based ionic liquid crystals: structure, photophysical and thermal behaviour of [Cnmim]Br • xH2O (n = 12, 14; x=0, 1), Cryst. Res. Technol., 2008, 43, 1187-1196. DOI: 10.1002/crat.200800345.